When a well-known Austin area restaurant was looking for help in financing equipment for their fifth location, they turned to Business Bank of Texas. A LED light manufacture outside of the Austin area recently requested financing for the expansion of their manufacturing building. Recently, Business Bank of Texas had the pleasure of assisting a marine contractor in Victoria, Texas. Recently, Business Bank of Texas had the opportunity to assist a grocery store owner in refinancing a business acquisition loan. 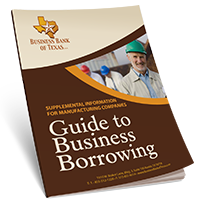 Our Borrower was pleased to learn that Business Bank of Texas wanted to help him with his financing. Recently, Business Bank of Texas was able to offer a real estate loan for $550,000 to refinance a church facility. In April, the bank leant money to a company for a $667,432 SBA 504 loan in order to purchase commercial real estate for a Medical Research Laboratory. Nobody knows nails like Brannen's. You'll learn that after a few minutes with owners Russell "Rusty" Brannen, Jr. Founded in 1947 by Rusty's father, Brannen's carries every type of nail, screw, bolt, anchor, and fastener imaginable. Riata Testimonial from Business Bank of Texas on Vimeo . KDR Electrical Service Testimonial from Business Bank of Texas on Vimeo .